Image © Juke Box Productions. Mike Tenicek seems like an ordinary citizen of Astro City, but like many others, super powers have changed his life. Miranda, his wife and true love, was erased from reality in a superhero event, so now only Mike remembers her. And he can’t forget her. She haunts his memories and dreams. Over time he comes to recognize that there are others out there with similar problems that are not being helped, and he forms a support group called Miranda’s Friends for citizens who have been mentally or emotionally scarred by contact with powered beings. Even those beings realize Mike has found a way to help they can’t provide, and they support him. Then he’s offered a choice: have his memories of Miranda wiped clean so he can heal, or keep things as they are. It’s not an easy decision. 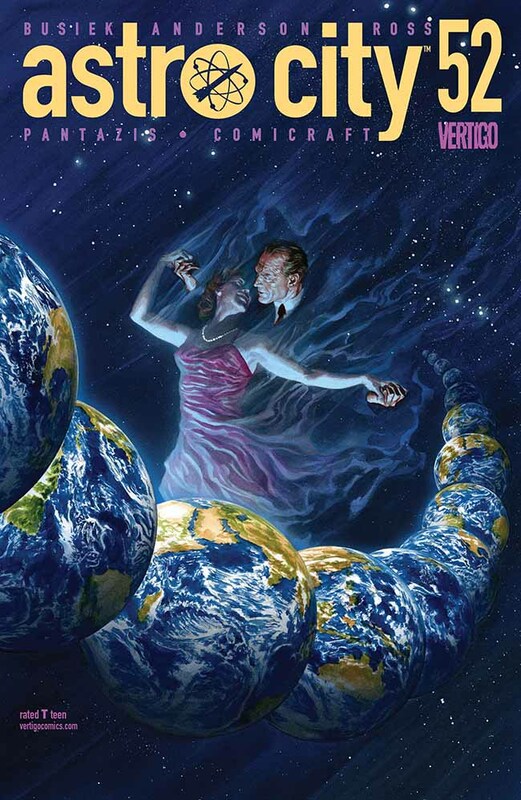 This final issue of the current ASTRO CITY series sticks to the original premise: the fallout, the consequences, the unseen harm (and sometimes the good things) that happen to ordinary people living among the powered people. It’s a poignant and heartfelt conclusion. ASTRO CITY is not over, though, it will return in a series of graphic novels. I look forward to that. This is probably my favorite series I’m not working on. This entry was posted in Comics, Reviews on July 9, 2018 by Todd.